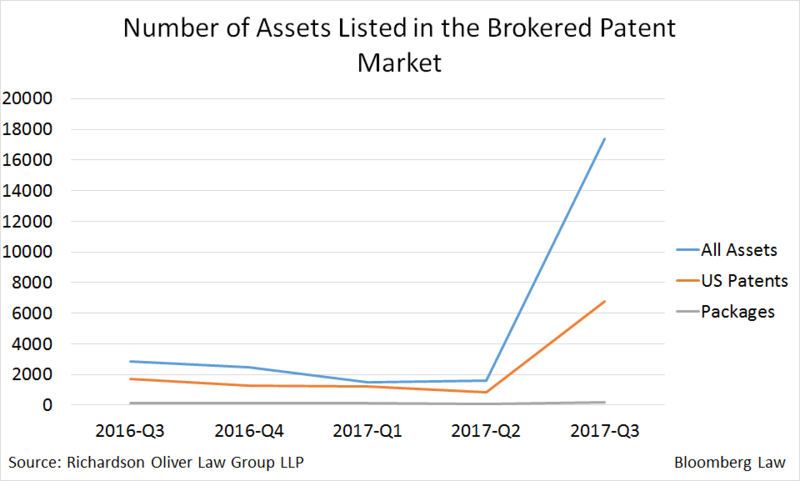 A new company with an unusual licensing model was the top patent buyer in the U.S.-brokered market in the third quarter this year, picking up a hoard of Nokia assets, according to data reviewed by Bloomberg Law. Provenance Asset Group LLC offers licenses to companies that need patents to defend themselves from companies asserting patents against them. A licensee gets an exclusive “slice” of patent rights to counter a patent lawsuit from a specific company, instead of having to acquire a broader and more expensive traditional license. Provenance wasn’t just buying from the brokered market. The company acquired a total of 10,500 granted patents and 2,000 pending patent applications from Nokia Corp. in the third quarter, the group’s chief executive Dan McCurdy told Bloomberg Law. The assets were purchased from the Finnish company’s units such as Nokia Networks, including patents of Alcatel-Lucent that it acquired last year. Provenance bought 662 of those patent assets from packages listed by Nokia Corp. on the brokered market during the third quarter, according to a review of data provided to Bloomberg Law by Richardson Oliver Law Group LLP. 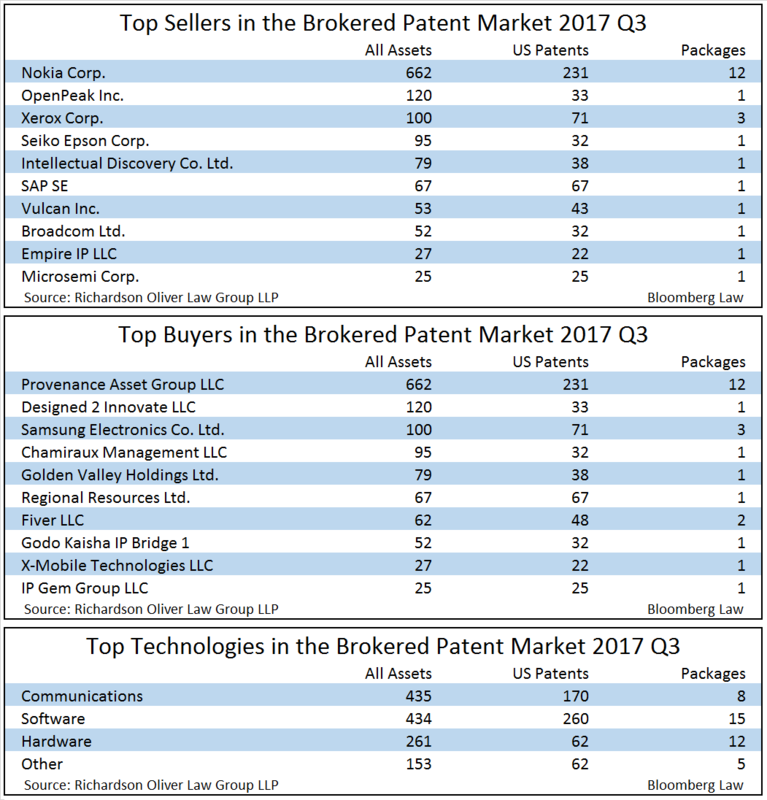 The brokered market, in contrast to direct company-to-company sales with no middleman, represents a small portion of overall patent sales between companies but can shed light on marketplace trends. Provenance didn’t buy all patents in Nokia’s listed packages but carefully selected patents with a range of priority dates that would fit its model, ROL Group partner Erik Oliver said. It’s too early to predict how Provenance’s business model will pan out, he said. “They were clearly thoughtful about what they picked and we need to learn more about them,” Oliver said. Provenance started offering its licensing model in late October. Provenance charges $100,000 a year per patent license for defense against one company, McCurdy told Bloomberg Law. Provenance will join lawsuits to give licensees the required legal standing in court to litigate, he said. Provenance will divest some of the patents “simply because we won’t be able to use all of these obviously in support of the core business,” McCurdy said. Maintaining a massive global portfolio would be too expensive because of maintenance fees required to keep patents in force, he said. Nokia and other large companies are downsizing their patent portfolios and listing patents for sale on the brokered market.The number of new patent assets listed, both U.S. and foreign granted patents and applications, on the brokered market in the third quarter totaled 17,372, a more than tenfold increase from the second quarter of 2017 and a sixfold increase from the same period a year earlier, according to ROL data. The total assets were packaged in 168 deals listed, up 60 percent from the second quarter and 18 percent from the same period a year ago. 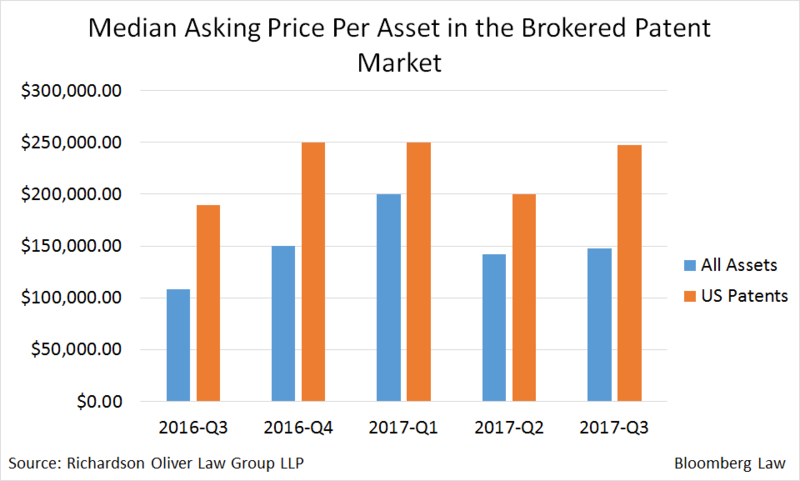 The median asking price per asset listed by patent brokers was $147,440 in the third quarter. That reflected a rise of 4 percent from the previous quarter, and a 36-percent increase from the third quarter of 2016. 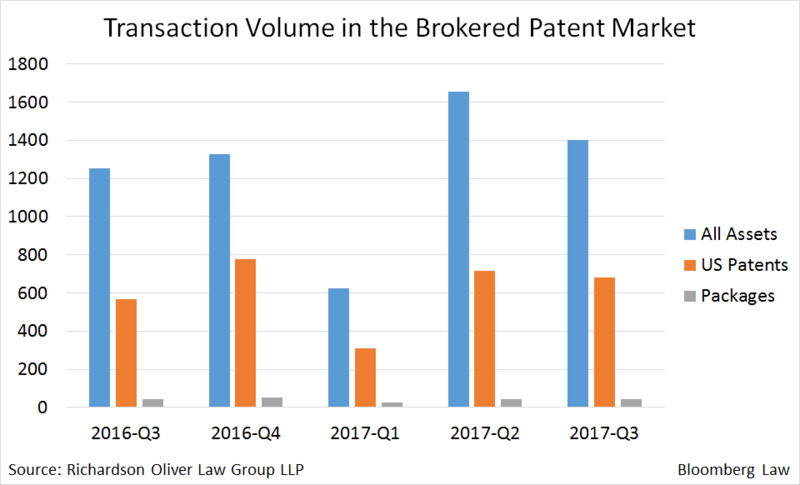 Top buyers in the third quarter included a number of patent holding companies, often called nonpracticing entities because they don’t produce a product or provide a service based on their patents. NPEs make money by licensing patents, and are known for aggressively asserting their patents against alleged infringers in court. Bellaire, Texas-based NPE Designed 2 Innovate LLC., which ranked second in the top buyers list, bought patents in a deal that listed 120 assets, including 33 U.S.-issued patents. ROL Group tracks the assignment of U.S. patents from various listed packages, comprising numerous U.S. and foreign patents and patent applications for sale, to identify when a sale is executed. Due to a lag in recording reassignments at the Patent and Trademark Office, ROL Group assumes that a given package is sold if any of the U.S. patents listed in the package are shown as reassigned in the PTO’s system. Designed 2 Innovate acquired assets covering technologies, such as graphical user interface display and remote control systems, from mobile enterprise management company OpenPeak Inc., which filed for bankruptcy last year, PTO records show. “Non-practicing entities are putting money on the table again,” ROL’s Oliver said. Operating companies also bought patents. Smartphone maker Samsung Electronics Co. Ltd. bought from sellers, including Xerox Corp., in three deals involving 100 patents, of which 71 were U.S.-issued assets. Ride-hailing service Uber Technologies Inc., which has been aggressively buying patents to defend against potential infringement lawsuits, continued a buying streak for the third quarter in a row, transacting in two deals involving 11 patents, including five U.S. patents. Uber bought patents covering identity validation and navigation system technologies from patent-holding company Eleytheria Ltd. and fleet-management company Teletrac Navman (UK) Ltd, according to PTO records.